Do you know, you have a wonderful spice right in your kitchen which is the only solution to all your skin problems? If you don’t know, then, you have come to the right place. We are talking about turmeric which you use to give curry its special yellow color. Due to its healing properties, it can be used to make turmeric face mask to treat many skin ailments like acne, blackheads, blemishes, etc. The wonderful benefits of turmeric face mask are provided below. Turmeric kills the P.acnes bacteria which is responsible for an acne. It reduces inflammation and removes excess oil from the skin and heals acne. The antibacterial and antiseptic properties of turmeric help remove blackheads, scars, and dark spots giving you a flawless skin. Calcium present in the turmeric heals dry and withered skin and gives you a smooth and glowing skin. Curcumin present in the turmeric inhibits skin pigmentation and reduces dark spots. Vitamin B6 present in turmeric forms new skin cells, moisturizes it, and heals dry skin. Turmeric helps you get rid of unwanted facial hairs by shrinking hair follicles and curbing the growth of facial hair. Curcumin present in turmeric regulates melanin production which is responsible for giving the skin dark spots, blemishes, and acne scars. The turmeric contains curcumin which reduces dark spots and lightens the skin naturally. The healing properties of turmeric deal with marks and promote the regeneration of healthy skin. Turmeric and honey both act as a natural bleaching agent. This face mask contains anti-inflammatory and antiseptic properties which kill acne-causing bacteria. It cleanses, hydrates and nourishes the skin of all types. Its healing properties remove acne scars, blemishes, and age spots on the skin. Best time to apply: It is better to apply this mask before sleeping and washing it next morning. Tips: Avoid using processed honey as it may contain artificial ingredients that can irritate your skin. Mix all the ingredients in a bowl to make a creamy paste. Wash your face with lukewarm water and pat dry using a clean and dry towel. Apply this paste on your face and let it stay on for about 30 minutes. After half an hour, rinse it off using lukewarm water. How it works: Yogurt contains antibacterial properties that kill acne-causing bacteria. This paste moisturizes and nourishes the skin keeping it soft and smooth. Tips: Do facial steaming before applying this mask to open up your skin pores and to get a glowing skin. Wash your face and pat dry with a clean and dry towel. Apply this paste on your face and let it stay on for about 15 minutes. Rinse it off thoroughly and apply a light and oil-free moisturizer. The turmeric works to reduce inflammation in the acne or pimples and prevents skin from darkening. The gram flour absorbs excess oil from the skin and cleanses pores preventing future acne and pimples. Rosewater tones and hydrates your skin. Mix both the ingredients in a bowl to make a smooth paste. Wash your face thoroughly and pat dry using a clean and dry towel. Apply this paste on your face and leave it for at least 15 minutes, then, wash it off using warm water. The antibacterial properties of this paste help clear out the infection and its anti-inflammatory properties reduce swelling and redness in the acne. Coconut oil maintains the natural oil balance of the skin giving you a healthy, smooth and glowing skin. Whisk the egg white and add lemon juice to it. Apply this mask to your clean and dry face and leave it for 15 minutes. After 15 minutes, wash your face thoroughly with lukewarm water. Egg white reduces acne and also fades the marks left behind them. It also tones the skin and gives it a beautiful glow. Turmeric deep cleanses the skin, heals acne, black spots and scars and provides a flawless skin. Mix all the ingredients in a bowl to make a paste. Apply this mask on your face and let it stay on for about 15 minutes. Wash it off using warm water and apply a light, oil-free moisturizer on your face. The anti-inflammatory action of curcumin helps reduce inflammation, its antioxidant and antibacterial action treats visible acne, blackheads, dark spots, and blemishes. It also decreases the visible wrinkles and lightens the skin pigmentation. This paste detoxifies the skin, removes the extra oil, and nourishes it providing a healthy and glowing skin. Wash your face with warm water and pat dry using a clean and dry towel. Apply this mask on your face using your fingers or a face brush. Leave it for at least 10 minutes and then, wash it off with warm water. Apply a light oil-free moisturizer on your face if it feels dry. Lemon removes excess oil from the skin and deep cleanses clogged pores. The antibacterial properties of this paste destroy bacteria responsible for pimples, acne, and whiteheads. The citric acid in lemon acts as a bleaching agent which brightens your skin naturally and treats marks, blemishes and black spots. Best time to apply: After the Sunset. Tips: Remember not to go out in the sunlight after applying this paste as lemon juice bleaches the skin and makes it vulnerable to sunlight. Mix water and turmeric powder. Apply this mask on your face and leave it on until dry. Wash the dry face mask using warm water. The anti-inflammatory and antioxidant properties of turmeric heals an acne by reducing inflammation and removing excess oil from the skin. It contains antioxidants that have strong anti-aging benefits and also aids to lighten and brighten your skin. Tips: You can also add oatmeal to make it more consistent and to get better results. Mix turmeric powder and olive oil to make a smooth paste. Rinse the face mask using lukewarm water. The olive oil gives a smooth and glowing skin by moisturizing it and providing it with essential amino acids. Turmeric shrinks the hair follicles and stops the regrowth of facial hair. Turmeric is an effective herbal remedy to fight skin ailments. 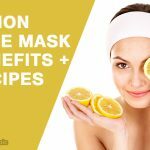 Using these affordable and simple turmeric face masks, you can get a healthy and glowing skin without going to a parlor or doctor.